From time to time, I will introduce you to some of Quebec wrestling scene’s players, whether wrestlers themselves, referees, ring announcers, bookers, and also to the numerous volunteers; each one of them is an essential part of a show and its set-up. Today, my spotlight is on a guy who belongs to the cream of the crop of indie wrestling: Mike Bailey. On March 14th, 2015, while we were heading for CZW, I was talking with Bailey. When I told him he was one of the best indie wrestlers, he felt ill-at-ease. I’ve realized how humble a guy he was. He’s no inflated ego, remaining firmly focused on his trade, which is entirely to his credit. Everyone who has seen him in a ring will concur with me: a wrestling show becomes better and more convincing when he’s a part of it. When they were still wrestling all across Quebec, Kevin Owens and Sami Zayn had been delivering strong performances. It is still the case now as, without a doubt, they were up to something really good for NXT. In my opinion, Bailey is on a par with these guys. His nickname “Speedball” is tailor-made for him. Among wrestlers, Bailey is not the beefiest. At 5 feet 8 inches, weighing 170 pounds, he’s got an average built. 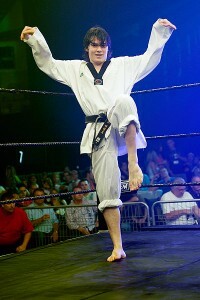 However, mastery of martial arts is a unique feature of Bailey’s skills, taekwondo in particular (don’t tell him about karate, as these are two different martial arts). With several years’ experience in taekwondo training behind him, Bailey can make wrestling fans marvel at watching him performing moves of his own. Performing martial arts gives Bailey an edge: the look of a dangerous fighter. Because of these unique skills, Bailey can defeat a bigger and beefier opponent than himself, and still be convincing. He’s been training in martial arts for 12 years, now. At first, he thought that martial arts would help him succeed in professional wrestling. As Bailey presently trains in taekwondo several days a week, martial arts are, nowadays, and more than pro wrestling, at the forefront of his passions. However, there’s a big issue with martial arts: Costs for training and competing (enrolment fees and travel costs). That’s why he would rather devote his weekends to wrestling, which allows him to travel free of charge and get paid while showing off his skills in the ring. As a wrestler, he feels lucky to get a wage. Promoters started offering him money as they were seeing him slowly looking away from wrestling. Bailey began training in 2006 with Fred “La Merveille”. At MWF, Fred was providing a different breed of wrestling courses than elsewhere. It was a time Bailey thoroughly enjoyed; he’s also learnt a lot. Trainings were given on Friday nights, but also on Saturday afternoons when a MWF show was being held on that same evening. People were having a lot of fun with Fred. There, Bailey has learnt the basics, the moves and the falls and, above all, to know how to improvise during a wrestling bout. Despite his training with MWF, Bailey gave his first fight for Paul Leduc’s FLQ (Fédération de Lutte Québécoise). He’s wrestled there from 2006 until 2012. He’s also been part of MWF’s regular roster. Having toured Quebec with his older Brother, he can also boast the remarkable achievement of having wrestled for most of the local feds: FLQ, MWF, NWC, WTA, SWF, WSS, 2AW, ALF, SWR, PWA, LLW, TOW, APW, SCW, GEW, MPW, NGW, FCL, NCW, PWF (we’re quite sure we’ve forgotten some). Nowadays, he wrestles on a regular basis for C4, IWS, Battlewar, ISW, WWA, Théâtre Extrême, CZW, PWG, SMASH, NSPW and CRW. Northeastern US-based CZW and California’s PWG are among the feds he presently works for. In April 2014, he started his CZW career by taking part in the Best of the Best Tournament. To make a long story short, he had wrestled with Drew Gulak in Montreal (Gulak was CZW champion at that time). Gulak had been amazed by Bailey’s performance, so he praised Bailey’s skills to CZW’s Management. As for PWG, the Promoter had been warned by nobody else than Kevin Owens not to overlook the Bailey phenomenon. That piece of advice has been promptly heard by PWG’s Management; Bailey started working for PWG on February 27th, 2015. Being an avid wrestling follower, Bailey had dreamt of being a part of PWG. He’s been studying the performance of wrestlers working for Dragon Gate USA and PWG for a long time, which makes him pretty acquainted with most of the wrestlers he’s called to work with. Watching other wrestlers work is of the utmost importance for him; that way, he may devise the type of fight he will perform with a given opponent, as well as know what kinds of bouts will be delivered during the rest of the show. As the NXT Division is now hiring more and more indie wrestlers, room is left for rookies to get into the best US indie feds. Mike Bailey is a safe bet. It’s quite easy to see how much satisfaction he gets from having performed a good match. So far, he has experienced a tremendous career; fans feeling the passion he shows in the ring has surely got to do with it. If you’re free to go wherever you want, make sure to choose a show where Mike Bailey is on the card; the show is sure to be a first-rate one. You might ask for a good testimony to that effect: following the CZW show I have been attending, fans were already wondering what Bailey would do next month, at the Best of the Best 2015 Tournament of April 2015.